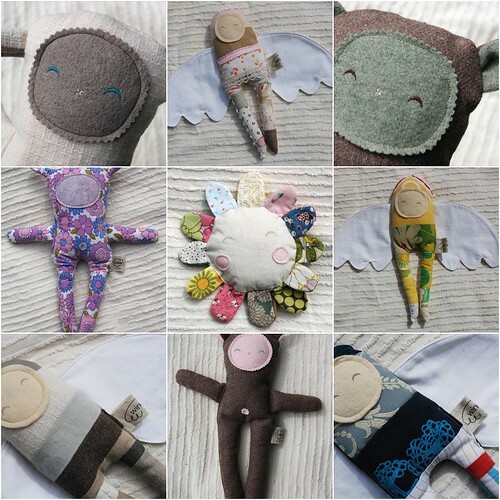 and i've finally updated my shop with a few little softies i made in a frenzy during the month of july. you can see the wintery colour schemes reflected in quite a few of them, which is now perfect for the impending north american autumn. i'm pondering splitting my goods up and having my more northern hemisphere themed treats in my etsy shop and then listing more australian-centric onegirl creations on the aussie made it. i tend to like to compartmentalize things and i have the feeling it's going to bug me having wintery items (and i've got some great new cold weather designs to work on if i ever get time!) mixed in with bright, summery coloured stuff. i might just be too lazy, though. anybody have any thoughts on this or used made it and want to give a review? I've sold one smock on MadeIt within 10 days of listing it, so good. But the fact that the site doesn't encourage dialogue or feedback really bugs me. I'm going to try it again soon! Maybe worth a try with a small amount of items first. i love the windsee on the top in the middle. the corduroy and colours remind me of back to school clothes. totally. it would be hard if the prices were in local currency too though because about 85% of my orders are from overseas and i think they'd find it hard or too much work to do the conversions, whereas we're a bit more used to it. maybe? I have been wondering the same thing - is it worth having two shops. I'm used to Etsy now, but I do wish you could use your local currency.